Photograph of kidneys showing gross features of polyarteritis nodosa. The patient died from uncontrollable hemorrhage of a ruptured aneurysm that bled into the retroperitoneum and peritoneum. The cut surface of the left kidney and external surface of the right kidney are shown. 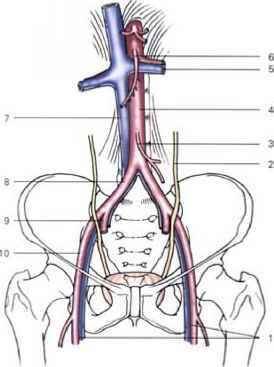 The upper pole of the left kidney has three large aneurysms filled with dark thrombus. These aneurysms are actually pseudoaneurysms because they are not true dilations of the artery wall but rather are foci of necrotizing erosion through the artery wall into the perivascular tissue. These necrotic foci predispose to thrombosis with distal infarction, and if they erode to the surface of a viscera they can rupture and cause massive hemorrhage. The kidneys also have multiple pale areas of infarction with hemor-rhagic rims, which are seen best on the surface of the right kidney.